The Ishinca Valley forms a right-side tributary to the Río Santa Valley. Its catchment drains part of the Cordillera Blanca northeast of Huaraz. The highest peaks exceed 6000 m in elevation. Whereas the lower slopes of this glacially shaped valley are covered by gnarled forests of Polylepis reaching above 4000 asl., the headwaters of the Ishinca Valley can be considered a natural laboratory for lake formation linked to glacier oscillations, with different generations of glacial lakes at different elevation levels. Some glacial lake outburst floods (GLOFs) have been recorded in the 20th and early 21st Century. 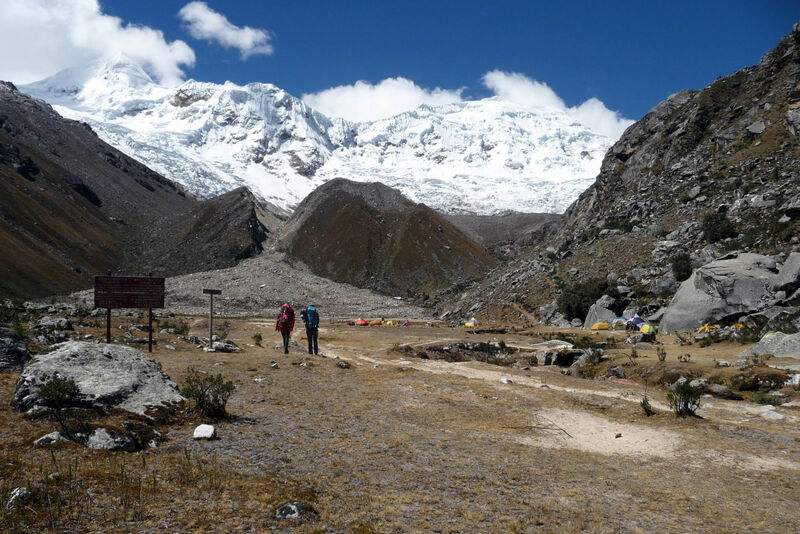 The valley is accessible through a system of trails leading up above 5000 m asl. The modern and well-maintained Ishinca Hut facilitates multi-day trips to the higher areas of the catchment. By clicking into the title image you can leave the Polylepis forest and proceed to the upper part of the Quebrada Ishinca. Due to significant losses in glacier length and ice thickness, terminal moraines have become disconnected from glacial ice over time and thereby transformed to natural dams. Exposed bedrock swells may form dams, too. The Ishinca valley serves as a textbook example for the evolution of glacial lakes over the last decades correlating with glacier change, as well as for the related hazards and the design of mitigation measures. Watch this video which leads you to the Ishinca valley, and gain a first overview of its impressive high-mountain geomorphology! This movie was created by Sandra Braumann. Timely correlating with glacier retreat, lake generations range from the oldest and lowest Lake Milluacocha all the way up to the youngest and highest Lake Adamcocha, which developed at the beginning of the 21st Century at 5170 m asl. Along with shrinking glaciers, lake formation processes will continue up to an elevation where slopes are simply too steep to provide enough space for large-scale water storage. Clicking on the circles leads you to the photos and descriptions of each place. Trail nearby Refugio Ishinca with the Little Ice Age (LIA) moraine in the background. The moraine builds a barrier for melt water released by the glacier, which has led to the formation of Lake Milluacocha behind the wall. The moraine dam collapsed in 1952. A mixture of water, till, and lake sediments spilled across the pampa below the dam and formed a massive sediment cone in a place where base camps are set up during the dry season. Luckily, the event of 1952 occurred during the wet season so that the camp was not populated at that time.